Odeon has just released its Limitless membership programme. In exchange for a monthly payment of £17.99 (£19.99 for Central London cinemas) you can watch as many films as you like at participating Odeon cinemas. Limitless will certainly save me money over the course of the year. With a full price adult cinema ticket costing between £10-12, I would only need to visit the cinema twice a month for this membership to make financial sense. So, I am excited to report that I am now a proud member of Odeon’s Limitless club. To save even more money, I decided to pay the 12 month minimum membership upfront - a cost of £205. This will save me just under £12 per year. I don’t know how you do maths, but to me that’s some free Ben & Jerry's right there! 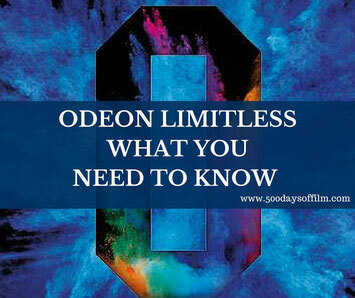 Are you tempted to join Odeon Limitless? Here is the information that you need to make your decision! To join Limitless you must be a permanent UK resident and over the age of 16. You will need a passport-style photograph ready to upload when you apply. This photograph will then form part of your Limitless membership card. When you join, you are committing to a minimum 12 month membership period. Limitless entitles you to book a standard ticket for a standard format public 2D film screening with a standard seat type in a standard auditorium - you may need to pay to upgrade if you want a Premier seat or for a 3D screening. If you choose the Limitless without Central London package, you will not be able to book tickets at the Odeon cinemas in Leicester Square, Leicester Square Studios, Panton Street, Covent Garden, Tottenham Court Road, Marble Arch, Whiteleys and Camden. You can book tickets using Limitless in an Odeon cinema or online. You cannot book tickets with your Limitless membership via Odeon’s apps, the mobile version of its website, or via Odeon ticket machines. You can book tickets for as many screenings as you want on the day you are booking. Members can also book up to two tickets for screenings on subsequent days. However, your bookings cannot overlap. You will not be able to use other offers, promotions or cards when using your Limitless membership to book tickets. For example, when using your Limitless membership to book tickets, you cannot use your Odeon Premiere Club membership to earn or spend points in the same transaction. You cannot use your card to book tickets for anyone else. The BFI IMAX and The Lounge at Whiteleys are not included in your membership (visit Odeon’s website for a list of all of the cinemas included in your Limitless membership). In addition, Odeon Event Cinema screenings (music, theatre, sport etc.) and special or private screenings (such as film festivals and premieres) are not included in the Limitless Membership. You can pay for your membership via credit or debit card. You can also set up a direct debit - but do make sure that you can maintain that direct debit. If you fail to make a payment, Odeon will charge you a £9.99 administration fee. You can use your Limitless membership as soon as you have joined online. Odeon will provide you with a printable temporary membership card and number to use while you wait for the permanent card to arrive in the post. You will need to bring this card with you when you visit the cinema. If you join Limitless and then find that it is not working for you, you can cancel your membership at any time. If you cancel within 14 days you will be given a refund minus the days you have been a member. If you cancel after the 12 month minimum period, and you are paying monthly, you will need to contact Odeon’s Limitless customer service number (see below) at least 30 days before you want your membership to end. If you paid the full amount at the start, you will not need to do anything as your membership will automatically end after the year. It is not as easy to cancel within the minimum membership period. Odeon suggests contacting its customer service department to discuss your cancellation. If you need any further information about Odeon Limitless, you could always give its customer service team a call on 0333 004 4411 or emailing via the contact page at Odeon.co.uk. What do you think of Odeon’s new Limitless membership? Do let me know via the comments section below! So pleased another cinema chain is doing a monthly pass now. Can't believe it's taken them so long to follow Cineworld with it. I have had my card for about 10 years now and it really does help you save so much money. Happy viewing although it does mean you will watch some awful films ;-) haha. Hi Deborah, I am sorry that you have had such a frustrating time... I have always had a good customer experience with Odeon, but I totally agree this is something that they need to address. I agree that this membership is not appropriate for anyone who doesn't visit the cinema regularly. There have been a few niggles with Limitless and I wonder if Odeon will address any of these in the near future. How much are the extras, like 3D, IMAX and glasses? Hi Rob, you may want to check at your local Odeon but, at mine, glasses cost an extra £1 and 3D is an extra £2. IMAX cost around £5 extra (apart from BFI Imax screenings which not included). Hi Carl, your Limitless card only applies to your own personal bookings. Any other seats will need to be paid as normal at the listed ticket price. When will there be a similar offer open to under 16's? This is of no use to a family with a young teen and a child under 10. Hi Emma, I have spoken with Odeon and they say that their Limitless scheme is very much in its infancy at the moment. However, they told me to watch out for some exciting new developments and I wouldn't be surprised if they introduced cards for kids or family Limitless memberships at some point in the near future. Fingers crossed! Last Friday (early afternoon) my Limitless visit was 'free' this Friday (same time) it will cost me the additional £1.75. When did Friday mornings/early afternoons become peak hours and why don't they advise users of these changes. I'm feeling more and more that my options are being limited when it comes to what's included in the price, which for me defeats the whole purpose of Limitless. I've only been a member for a month and really love the idea but I doubt I'll renew next year if the restrictions continue. I am sorry to hear that you have had to pay an additional charge for your cinema ticket... did they tell you why this was? I have only ever had to pay extra for 3D screenings or Premier seats. Do let me know as that doesn't sound right to me and may be something I need to investigate. Hi Jane, it was a booking via the online app not the cinema itself. Typically having just tried it again this time it deducted the whole £9.75, rather than the £8.00 (for non peak time screenings). Possibly my mistake so my gripe is rescinded because any additional charges I have paid are those I knew about when I signed up. Occasionally I do find the app glitches and tells me a film isn't eligible for limitless (when I know it is and I've only got one pre booking). Thank you for your reply though. You are welcome Anne! I hope that you don't encounter any more glitches! Can you go to performances at any time of the day and if you prefer Premier seats what is the extra cost? Finally there are three of us, can we book all three online at the same time or do we have to book individually? Yes, you can use your Limitless card to watch films at any time of day. You can also use Limitless for Silver Screenings and Screen Unseen films. You have to pay an extra £1 to upgrade to Premier seats. Sadly, you can only use one Limitless card per booking at the moment. If you want to book seats for three Limitless members you would have to book one at a time. This is pretty frustrating. I am hoping that Odeon will address this issue in the near future. I hope that you enjoy your membership! Hi there, I am sorry that you have had this experience. I'm guessing you have already spoken to Odeon's customer service (their number is 0333 004 4411)? I do hope that things get resolved for you. I think the idea is great, just a tad expensive and kind of forces you to watch films you don't particularly want to watch, but you will do simply because you have the card. I guess in hindsight, it does work in ones favour because you don't have to worry about buying your ticket and waiting in queues etc, or am I wrong and you still need to go to a ticket booth and present your card and go through all that? I kind of assumed you could show your card and they print the voucher off, the self serve machines are so slow that it borderlines pointless in Leicester's ODEON! As well as that, there's very few kiosks, so at peak times you'll be waiting ages to buy your tickets deeming the Limitless card pointless too? Can you collect tickets booked online from the ATMs as normal or do you have to queue up to show your card to someone to get tickets? You can collect your tickets from the machines as normal. Your Limitless ticket will have a 'Limitless' heading on it and you may then have to show your card when your tickets are checked. Thanks Jane, so you can collect tickets from ATMs but you can't book the tickets using it. I just wanted to know what differences there are in booking and collecting tickets using Limitless instead of a Credit/Debit card. Hi Fred, You can certainly collect Limitless tickets from the ATMs. I have never booked tickets using these machines so am not sure how this works with Limitless. Am going to check this out today - great question! Happy New Year! I have signed up to a subscription outside of London however I am planning on moving there in a few months time. Would I be able to change my membership to include London central cinemas as well? I have an answer for you - sorry about the delay! While you can collect pre-booked tickets from the Odeon ATMs, you cannot book directly from these machines. Thanks for stopping by! Great question... I asked Odeon and, unfortunately, you cannot upgrade. I am really sorry about that... seems strange to me that they can't upgrade your membership. Might be worth a call to their head office as Limitless is so new they might change their minds. What does that apply for kids 8 years old?? If you join?? Hi Yvette, Odeon states that, generally, you must be 16 or over to join Limitless. If you are 13 -15, you can join Limitless via a gift membership, but you must obtain consent from a parent or guardian before joining, and ask them to help you through the joining process. I realise that this does not help you with your eight year old. I do wonder, however, if a family or child Limitless might be something that Odeon might consider in the future. If me and my partner both got a limitless membership, would we still be able to book seats together? I hope that you are well. Now this is where Limitless is a bit of a pain at the moment. In order to sit together you would need to make two separate online bookings. It's not ideal. However, I wouldn't be surprised if this changes in the future to allow us to use multiple Limitless memberships in one booking. Fingers crossed! I am so sorry that you are having these issues with Limitless. Odeon tell me that they have lots of plans in the pipeline for Limitless. I wouldn't be surprised if they address these booking issues in some way. I appreciate that this does not help you or your mother right now. Fingers crossed that Odeon sort this issue out soon. I will keep you posted of any updates. I guess it's good if you want to watch the same movie twice perhaps? But after reading reviews on this, it seems that the "limitless" card, is quite limited lol. Great article, Jane! Thank you! Thank you for taking the time to leave your thoughts on Odeon Limitless. I don't have a Cineworld cinema near me so I am very interested in the comparison between the two memberships. I agree that the group booking issue is extremely frustrating. A solution to this problem can't come quick enough. Also sorry to hear that you had a bad cinema experience. Did you let Odeon know? I have always found them to be really helpful. Never heard so much whinging. Odeon Limitless is a great deal if you go to the cinema a lot. The Odeon app is too glitchy, so use the desktop or mobile site to book Limitless tickets. Thanks for your comment! I love my Odeon Limitless card. While I appreciate that it has some issues, it certainly works for me and has saved me so much money!! I was thinking about signing for Limitless, but after a quick Google search and a live chat on Odeon's website. They confirmed that you can't use Limitless with a Meerkat Movies code. Hi Simon, thank you for that clarification. There are certainly some limitations to Limitless. I still wouldn't be without my card, however! does limitless allow you to take more than 1 person for free ? Sadly no... your Limitless card only allows you to book tickets for yourself - everyone else has to pay as normal. i been reading up on limitless, and i see the word book all the time.. I am so use to just passing my local cinema, see what on, and go in and buy my ticket at the counter.. So sorry not to have replied to your message... I agree, the inability to book seats together is a real problem. It is not insurmountable but is still a significant pain. My guess is that Odeon will do something to address this soon. Will keep you posted! With regards discounts off food... they do offer that. Every month there is a different "member exclusive" deal. This month it is 10% off all food and drink. Would that tempt you? It costs an extra £5 for an IMAX film (apart from BFI Imax screenings which are not included). 3D is an extra £2. I would be tempted to join limitless if you could bring a friend or have a reasonable rate for a joint membership, how often does someone go to the cinema ALONE.....to me this would make you more money if you done a membership to include a guest for like £250 you'd probably sell more ! Thanks for stopping by! I agree that it would make a lot of sense if it was easier to secure multiple Limitless seats in one booking. Also a family/group subscription would be very tempting! I cancelled my membership months ago as I was not using it enough, so my direct debit as ended. But on my odeon account it still shows when I book tickets it still says I'm a limitless member and I can still use the option to get the ticket as a limitless member. That is strange. If you are concerned about it at all, I would contact Odeon customer services. How do you collect Limitless tickets via ticket machines? I went and inserted my bank card but the machine said there were no bookings on my card. I had to go to the till instead. Am I doing it wrong? This has happened to me too! If you are only collecting a Limitless ticket, the machine won't register your booking via your bank card. In some machines you can use your Limitless card instead and it will give you your ticket. Otherwise, you do have to go to the till. Is there any news on group bookings ? Me and my partner are thinking about getting limitless as we go to the odeon kids every week and also stop by to watch afew films. How does limitless affect premier club ? I have been a club member for the good side of 7 years ? Sadly, no news as yet. I will ask Odeon if they have any updates and let you know because the membership is crying out for a way to make group (or even two!) Limitless bookings. Regarding your Premier Club membership, you do not accrue points on Limitless bookings but if you make a booking using both Limitless and 'ordinary' seats you will get your points for the non-Limitless part of your booking. Hi just wondered if you plan on seeing the same film more than once is this possible? My limitless is coming to an end do I have to do anything or will it just carry on? Also will my old card still work or will I need a new one if I renew? I hope you are well. When my card expired, Odeon sent me an email with details about how to renew my membership. This was then updated on my existing card. My wife and I have signed up to this - the maths are pretty simple - if you go, on average, a couple of times a month it is worth doing. Not being able to book more than 1 limitless seat on one booking is massively annoying - we tend to have two browser windows open and book simultaneously - clunky! Thinking about getting Limitless but was wondering how much extra I would need to pay to sit in a recliner seat? Also is there a permanent discount on food with limitless or is it only as and when they offer it? AP, I completely agree with you re Limitless. It makes such financial sense if you go to the cinema around twice a month. However, I also get frustrated by the fact that I cannot book two Limitless seats together easily. I also find the fact that you can only book two Limitless tickets in advance tricky... would love to book more! Hi Amy, interesting question.... I don't have recliner seats in my cinema. Do they class these as Premier seats? If so, you would have to pay £1 extra per seat. Meanwhile, the food discount varies from month to month. Odeon send Limitless members an email alerting them to future offers. Some months are better for me than others I have to admit! I hope that this is helpful. Let me know how you get on if you decided to go Limitless! all i want know before going ahead with this is CAN YOU USE THIS FOR ATLEAST TWO PERSON FOR ONE SCREENING?? EACH TIME I WE WANT TO GO?? Hi Grant... I think that you can only pay the first month of your Limitless membership with a credit card. Then I believe that you have to set up a direct debit via your bank account. If you have any problems, I would suggest you give Odeon's Limitless customer service number a call 0333 004 4411. Thank you for stopping by! Limitless is a membership for one person (you get a membership card with your name and photo on it). If you wanted to book via Limitless for two people for a screening you would need two Limitless memberships. I should warn you that booking two Limitless seats is a little tricky at the moment. You have to do this in two separate bookings - hoping this will change soon though! Really wish i'd seen the comments before I joined. My husband and I both purchased and joined the premier club to collect points. Despite booking separately and on separate devices we couldn't get seats next to each other other. First visit we were 3 seats apart and had to ask other customers if they'd kindle move. Tried to book again and had the same issue. Spoke to someone on live chat to be told that booking on separate devices is the best way to go but 'it doesn't always work'! So Odeon are expecting us to make a 20 mile round trip to book tickets then the same again to actually see the movie. MASSIVE FLAW!! We are currently in the process of asking for a refund for both Limitless and Premier Club. IT COULD COST YOU AS MUCH AS £67.99 A MONTH! If you find yourself a bit skint one month, then Harlands, Odeon's billing agents, will charge you £9.99 for every failed payment - up to five times in a month. To be fair, Odeon have waived all the fees in my case as it was down to a banking error - but the late payment charges in the contract are disproportionately severe. Hi Rebecca, if you have subscribed on a monthly basis your membership will continue unless you cancel. However, if you paid for a year upfront it will stop unless you pay to carry on. Odeon will email you to give you that option. How do I book two limitless tickets on the App? I can only book mine & not my partners. Does limitless include odeon unseen tickets ? Paul, with regards your question, frustratingly you can't (at the moment) book two Limitless seats at once. You have to book your Limitless ticket, come out and log back in as the other Limitless account and book the next ticket. For me, this is one of the main drawbacks of the membership. I do hope that Odeon makes it easier for us soon! Tom, yes Limitless includes Odeon Screen Unseen. Enjoy! It's a great facility, if you just want to turn up at the cinema and hope there are seats available for the film you wish to see. However, I have attempted several times to book online using it without success. Whenever you get through to the payment screen there is no option to put in your Limitless card and nor are you prompted to do so at any other point in the process. Hi I was just wondering. How long did it take for your card to arrive in the post. I started my membership at the beginning of the month and my card still hasn’t turned up. I’m fine using the temporary one at the moment but I was just curious. Hi Rachel, I think my card took a couple of weeks to come. It seems odd that yours hasn’t arrived. Perhaps give Odeon a call? Their number is 0333 006 7777. I hope that you get your card soon! I am wondering if you can use the limitless card in an Odeon Luxe cinema? Really appreciate all this info! I'm definitely going to be signing up. I was just wondering though, how much extra is it to see a movie with ISENSE ? Is it the same as IMAX? Also, does it have to be a digital photo used for the card? Or is there a way I can send off a passport photo? So I’ve been reading comments from January and March 2017. There have been a lot of comments in regards to being unable to book next to one another with another limitless holder. Despite the numerous replies of ‘I imagine this is going to be fixed soon’, it’s now April 2018 and you still can’t do it. Having recently taken out a limitless membership with my partner I find it laughable how this hasn’t been fixed yet, how hard can it possibly be to allow you to sit next to each other, even if you’re booking on two separate devices. Finally no, I do not want to hear that there is a 14 day cancellation period since I visit the cinema most weekends and want to save the money. I have had my card since Christmas, and it has definitely proved value for money. The only problem I have with it is I haven’t discovered a way yet of pre booking a ticket online. I go through the process for my local cinema but when I get to the payment screen, there is never an option to use my limitless card. I have been through the process several times and scrutinised the screens very carefully. At no point have I found an option that allows you to use the limitless card. Has anyone else had any success with this. And if so how? Anna - there ought to be a blue "Use Limitless" link next to the ticket price on the very last screen. Also on each screen of the booking process there should be a full-width bar with the header "As you're a Limitless member... ", along with a picture of the Limitless card and some instructions - if you're not seeing this, it may be that you're not logged in with the correct details... when I joined Limitless I had to log out of my old account and log in with my Limitless account details. Hope that helps! Hi Hannah, so glad that you have found this post useful. Yes, like IMAX you have to pay a little extra (the exact amount varies) for ISENSE. Meanwhile, I believe that you have to send a digital photo. They then pop this on your Limitless membership card. Hi Dan, I do feel your frustation. I do not work for Odeon so cannot predict if and when things will change but I really hope that they do... I will pass your comments over, however. Fingers crossed! Can you get a limitless family membership? I would looking for 2 adults and 2 children. They don’t do family memberships. Just individual ones. Thank you so much for answering Phil’s excellent question Ammar. They should definitely do family / children’s Limitless memberships shouldn’t they. I would sign up for that! Thanks for stopping by... I agree, it would be amazing to have a children's Limitless card or a family membership. I'll ask Odeon if there's any chance and keep you posted! Thank you so much for your kind message. It all made perfect sense to me :) I am so pleased that this page has helped you - that's made my day! Let me know how you get on with Limitless. I wouldn't be without my card! How do I renew my limitless card ?! Usually, Odeon will email you to offer you the chance to renew. You can also renew online if you log into your Odeon account. Have you enjoyed Limitless? I love the card. I have watched different type of films that I maybe wouldn't have gone to see had I not Limitless. Obviously there may be some i don't enjoy as much as others, but with Limitless it doesn't seem so bad, better than paying the full price and not enjoying it. If you have limitless do you still have to pay for the cinema tickets or are they free ? With Limitless you pay a monthly (or, as I do, yearly) fee and you don’t have to pay any more for your standard Odeon ticket. There are some exceptions (see above) but for the most part you won’t have to pay any extra. If you go to the cinema more than twice a month you can certainly make your money back! How much extra would i need to pay for Gallery viewings please? How much extra is it to watch a film in ISENSE 2D? There are two of us with Limitless Cards yet we have to make two separate bookings in order to see a film, how can we book together? Why don’t I get it deon limitless points on my premier points card? I wonder why can’t I just pay let’s say £5 if I want to go to Odeon Camden as I am a member of Limitless for more than a year now. And also if I want to include Central London, you have to change the ID? I see that Odeon does not allow any discounts for Limitless members without a Central London membership if they want to see a film in one of these Central London cinemas. It would be lovely if they did! Hi can you upgrade to gallery view when you are a memeber of limitless ? If so what is the cost of this ? Hi Jane, as I am moving away from a local Cineworld to a 'local' Odeon I am thinking of getting a Limitless card. I LOVE my Cineworld Unlimited and wanted to know if a Limitless card gives you the possibility of having cheaper 'Event' tickets and also, are there Limitless Screenings (or Secret Screenings) for members to have a preview of coming films? These are all things that I have enjoyed with an Unlimited card and could be the deciding factor about whether I renew with Cineworld (and have to travel) or go for a Limitless (within walking distance). My daughter is trying to cancel her limit less card because she can no longer afford it,but she can't until you have proof she no longer works which in some cases can be difficult , but you are quite happy for people to get in debt , your customer service are no help. Meanwhile, yes Odeon does do regular secret screenings (called Screen Unseen). The last one was Boots Riley's Sorry To Bother You. Let me know what you think of Limitless! Thank you for your message. I am very sorry to hear that your daughter is having trouble canceling her Limitless card. I am not affiliated to Odeon so unfortunately cannot help with this - I would suggest trying again with customer service? I do hope that things are sorted out soon. can i use limitless at screen 15 in kingston? Couple of months in, and my experience so far is so-so. Booking system can be messy, a film I could book at one moment (but then didn't get processed due to an unspecified error) suddenly can't be booked anymore. Not a singular occurence either. If it does work, it is great though. Also very disappointed with the fact that so many films I wanted to see don't run in my local cinema (Crewe). Had I realised this I probably wouldn't have signed up. Have Odeon sorted out booking two limitless seats in one transaction yet? Cineworld have managed it for years! Sadly no... nothing has changed, which is frustrating. How does Cineworld manage on its site? There has to be an easier way to book! Sort out your booking system ! I was a Cineworld customer and decided to come to Odeon after the lovely refurbishment. I am very disappointed and I am thinking of going back to Cineworld due to having to book 2 limitless tickets separately. It’s so frustrating, my husband And I both have limitless cards and find it extremely difficult to book two seats together. Once I’ve booked one ticket and logged out, then logged in to book another, the seat has gone ! What a shambles ! Never had this problem with Cineworld. Another problem I’ve had is people messing about in the screen and sitting in other people’s pre booked seats. The staff can’t do anything about it, Cineworld does not put up with any of this kind of behaviour and people not behaving properly are either told to leave or sit in the correct seat. Hi. I’ve bought a limitless membership with my hubby. I get a discount via my work so we got a third off the yearly cost. Even better savings! I doubt the booking separately issue will ever be solved, given it’s now 3 years since you started this blog thread! It’s no biggie for us. We go to our local Odeon Luxe and have never had to sit apart. One thing I noticed was that I used the app and website to book central London tickets and it lets us get them on limitless! Even though we have outside London cards. We didn’t go through with the booking past the basket stage. As no one has checked for our cards when we go into a screening so far in 8 movies, I’m wondering:- has anyone else ever booked for central London with an outside London card? And how did you get on?